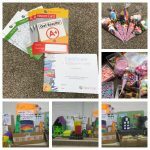 Alhamdulillaah yesterday afternoon we came to the end of the winter term 2018 at the Tuition Club and to celebrate the achievements of our home schooled students, we held an end of term ceremony and a parents afternoon. Some of our Arabic students also gave a presentation and spoke about the environment. They spoke about the different ways we can protect the environment from pollution. Also, we had some lovely speeches from some of our home-schooled children. We hope you all have a lovely winter break, and we look forward to our students returning on Wednesday 3rd January 2019 in shaa Allaah.